"I spoke about this game two or three times before because it’s a difficult one. The game we had against them earlier in the season was the first game where we were behind. So you could see how we reacted there, but also you have to talk about what a good job Getafe did in that game. They are a team that gives up very few goals away from home, they have defended very well since gaining promotion, and they’re just a few points from a spot in Europe." "It’s much easier with the fans on our side. We play better with their support. We’re heading towards the final part of the season when titles get decided, so we need to get through these games and people need to understand how difficult they can be." "I don’t know. We’ll have to see. We have high hopes for him, and we need to be careful. Hopefully he’s going to do things in this phase of the competition, which is so decisive, but he’s the kind of player who I think can help us. He’s been getting into the group dynamic and slowly adapting to the team and tomorrow is a good game for him to be involved." "Thomas Vermaelen is coming to the end of his recovery. Next week he might be able to join the squad but we’ll see how the week develops. As for Gerard Piqué, I’m not going to tell you if he’s going to start the game tomorrow or not. 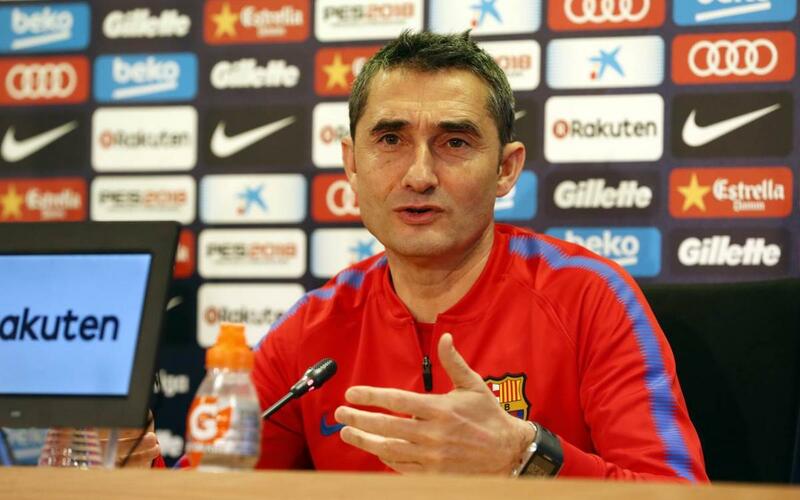 Yes, he does have some fitness issues from the Espanyol game, and we took a risk on Thursday because it was such a decisive game, but tomorrow is also an important game, so we have to assess the situation." "He might play, like all the other players in the squad. If I decide to play him, he’ll play, and if not, he won’t. The other day he made his debut and he wasn’t on very long. That’s true, but things don’t stop. We’ve got an important competition to play and he has to get used to things." "He’s a striker a lot of teams would want, but we’re lucky to have him here with us." "What do you want me to say? Our job is to qualify for the final, the rest is somebody else’s job. The ideal thing would be to know at the beginning of the season where it’s being played to get rid of all the speculation. We have this process every year. I guess it gives people something to talk about, I think that’s the idea. It’s not one of my biggest concerns, if you want me to be quite honest." "This game is coming right on the heels of the Valencia game, and with a 4 o’clock kickoff. So we need to reactivate ourselves for this game, and it’s an important game as well. But I think for us and the fans, we know it’s an important game. We are in the second half of the league season and we want to maintain our lead against our direct rivals. We are playing at home, so we want to be sure that we get three points. But Getafe are coming as a team that puts pressure on you. They’re a very uncomfortable team to play against. They don’t leave you in peace. They’re always threatening on the counterattack, they play the ball towards your back, and they’re a team that doesn’t lose many games." "I’m not going to let the opposing coach know that, unless it’s something really clear. I’m not going to give clues away in public. I’m not going to tell the opposing team who I’m going to play. That may affect their plans for the game." "I think he’s been reinforced. To score a goal, you have to be in the right place at the right time. He’s a player who takes on opponents, he’s good in the one-on-one game, and little by little we’ll get to see even more of him." "People can have a lot of hopes for many things, and it’s good that people have hopes. We like that. We’re professionals. You always want more titles. But right now we have none. We’re in the final of one, we are in a good position in the league, and then there’s the Champions League, which we would like to fight for too. We know that to win one of those titles, we’re going to have to beat Getafe tomorrow." "As long as we win, it doesn’t really matter."